You can include Meals On Wheels Erie in your will or estate plan to forever be a part of our mission of doing good in Erie, PA. Even a small amount can have a big impact over time. You can, in fact, leave a legacy. Of the many planned giving solutions, here are three of the simplest way to make a gift to your favorite charity. Leave money to both your family and to your favorite charity. Prepare a will (a bequest) to ensure that your hard-earned dollars go to the people and institutions that you care about. Gifts can be a fixed dollar amount or a percentage of your total estate. You can leave a life insurance policy, stocks and personal property. A life insurance death benefit, for instance, may be considerably greater than the premiums paid, enabling you to contribute a future sum much larger than a current gift of cash. Consider making Metro-Erie Meals On Wheels, Inc. (dba Meals On Wheels Erie) a beneficiary of your IRA. When making a planned gift, it is always recommended that you consult with a legal professional, licensed financial planer, accountant or CPA. Donors include a provision in their will directing that a gift be paid to a nonprofit organization upon their death or the death of one of their survivors. 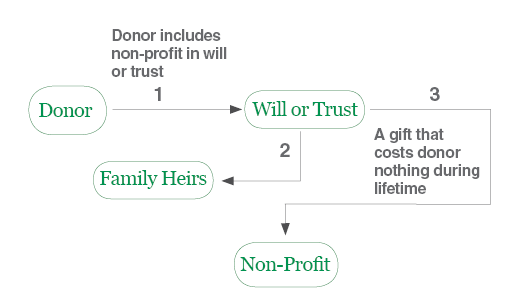 Donors can give an organization either a specific amount of money or item of property (“specific” bequest), or a percentage of the balance remaining in their estate after taxes, expenses, and specific bequests have been paid (“residual” bequest). Donors can also contribute a policy on which some premiums remain to be paid. Donors can claim a charitable deduction for the value of the donated policy, and the organization can “cash in” the policy in advance of the donor’s death. Donors receive a gift credit and an immediate income tax deduction for the cash surrender value of the policy. Donors can (revocably) name an organization as the beneficiary of a life insurance policy that they continue to own and maintain. Donors can name the organization the owner and beneficiary of a new life insurance policy, and make ongoing gifts that offset the premiums the nonprofit will pay to maintain the policy. There is no charitable deduction available for taking out a new life insurance policy, even if the donor makes the nonprofit the irrevocable owner. 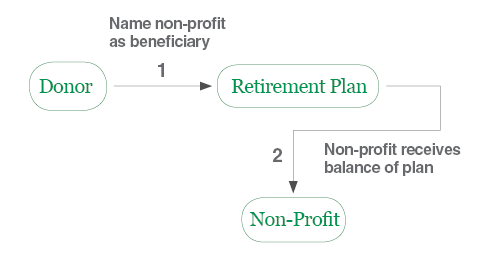 Donors can name a nonprofit organization the successor beneficiary of all or a portion of their IRA, 401(k), or other qualified retirement accounts. The designation is revocable and does not generate a charitable income tax deduction.